Outstanding Crochet: Projects done and in work. Projects done and in work. Anyway, it is coming together. I think it's the hardest part for me - to write instruction for the other sizes but prototype. and working on a new project. I think it will be a pullover. I have an idea, but very often it gets changed it in the process. Also I made Boho style long duster with fringe, which I absolutely love, but it needs a button I haven't found yet. I think it's a good idea to start charts and instructions on a computer while the piece is in work. It's much easier to do the pattern after all when something is already done, because when you finish a project you already sick and tired and wand to move on. Don't forget to stand up every 15 minutes! Stay healthy! Your cardigan is very beautiful. Wow everything is s beautiful Natalia. You have such great taste and your projects are so detailed. Very, very beautiful. Great job. Good luck with your green card. Me encantan los brazaletes, lovely!!! Natalia, a una señora de 80 años le preguntaron cual seria la edad a la que regresaría, ella ha dicho 40, porque? ella ha dicho que es el mejor momento de la vida, no los 20 años, no los 30 años, los 40 !! Ahora también tengo 40, entonces a disfrutarlos para pensar lo mismo a los 80 años. Saludos, te sigo desde hace tiempo y me gustan muchos de tus trabajos y la pasión que tienes por el crochet y sobre todo que pones manos a la obra. Thank you, Eli! I agree with that! We are so much wiser when we turn 40! beautiful work! I just run out of praises! keep on inspiring us! These are all absolutely wonderful but I particularly like the triangles, what a fab use of colour and stitches! Good luck on the green card. You inspire me!!! I've also written patterns into words... it would be so wonderful if crocheters read charts... it's so much EASIER. 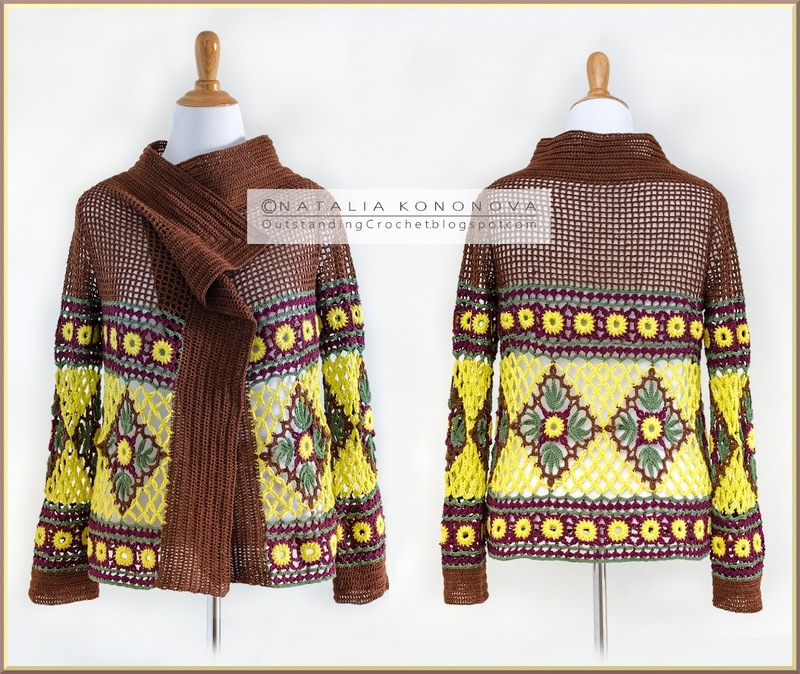 I've not written a clothing pattern YET that needed sizes (only have done shawls as far as clothing goes) but yes it does stretch your brain connections and helps you stay mentally younger...so keep doing it. There is a study going on about how crochet helps the brain... do you know about it? Also praying for your green card, would hate to lose you. You are such an inspiration and much loved. I talk about you and your site to all my crochet students. Soon I will be starting an Irish Crochet class due largely to the inspiration of your site and Irish Crochet Lab site so pray for us also. Thank you, Janet! It's great to hear! I wish you the best with your class and all your projects! Thank you, Loree! I probably made everybody sick already telling my story how I am not allowed to work in US with my visa H-4. I am waiting for my green card process to finish and then I will sell my patterns. I think it will happen in 2015! :)) I will let everybody know. Hola , tus trabajos son fascinantes,,,, muy bonitos!!! Cariños a la distancia,,, desde Argentina!! 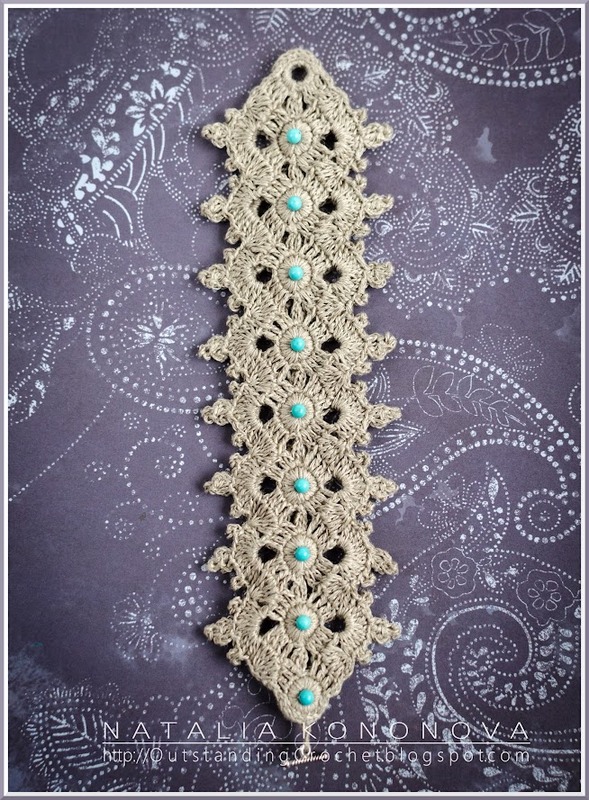 I love the pattern for the diamond motif bracelet! Do you have a site where you sell patterns for your designs? Oops! Sorry! I just noticed a previous reply to my same question!!! I'll be praying for that green card for you!!! Seus projetos são lindos Natália!